The classical or traditional Mongolian script,[a] also known as the Hudum Mongol bichig[b], was the first writing system created specifically for the Mongolian language, and was the most widespread until the introduction of Cyrillic in 1946. Derived from the Old Uyghur alphabet, Mongolian is a true alphabet, with separate letters for consonants and vowels. The Mongolian script has been adapted to write languages such as Oirat and Manchu. Alphabets based on this classical vertical script are used in Inner Mongolia and other parts of China to this day to write Mongolian, Xibe and experimentally, Evenki. Computer operating systems have been slow to adopt support for the Mongolian script, and almost all have incomplete support or other text rendering difficulties. Mongols learned their script as a syllabary, dividing the syllables into twelve different classes, based on the final phonemes of the syllables, all of which ended in vowels. The Traditional Mongolian script is known by a wide variety of names. Due to its shape like Uighur script, it became known as the Uighurjin Mongol script. [c] During the communist era, when Cyrillic became the official script for the Mongolian language, the traditional script became known as the Old Mongol script,[d] in contrast to the New script,[e] referring to Cyrillic. The name Old Mongol script stuck, and it is still known as such among the older generation, who didn't receive education in the new script. The traditional or classical Mongolian alphabet, sometimes called Hudum 'traditional' in Oirat in contrast to the Clear script (Todo 'exact'), is the original form of the Mongolian script used to write the Mongolian language. It does not distinguish several vowels (o/u, ö/ü, final a/e) and consonants (syllable-initial t/d and k/g, sometimes ǰ/y) that were not required for Uyghur, which was the source of the Mongol (or Uyghur-Mongol) script. The result is somewhat comparable to the situation of English, which must represent ten or more vowels with only five letters and uses the digraph th for two distinct sounds. Ambiguity is sometimes prevented by context, as the requirements of vowel harmony and syllable sequence usually indicate the correct sound. Moreover, as there are few words with an exactly identical spelling, actual ambiguities are rare for a reader who knows the orthography. The below rules for writing apply specifically for the Mongolian language, unless stated otherwise. Other modern orderings that apply to specific dictionaries also exist. For a visual comparison of how letterforms may differ between styles see § Comparison of writing styles. The back, masculine, hard, or yang vowels a, o, and u. The front, feminine, soft, or yin vowels e, ö, and ü. The neutral vowel i, able to appear in all words. 1925 logo of Buryat–mongolian newspaper ᠪᠤᠷᠢᠶᠠᠳ ᠮᠣᠩᠭᠣᠯ ᠤᠨ ᠦᠨᠡᠨ᠃ Buriyad Mongγol‑un ünen 'Buryat-Mongol truth' with the suffix  ᠤᠨ(?) ‑un. Separated suffixes starting with, or made up by the letter, include: ‑a, ‑ača, and ‑ačaγan. Medial and final forms may be distinguished from those of other tooth-shaped letters through: vowel harmony (e), the shape of adjacent consonants (see QA-q/k and GA-γ/g below), and position in syllable sequence (n, ng, q, γ, d). The final tail extends to the left after bow-shaped consonants (such as b, p, f, KA-g, and KHA-k), and to the right in all other cases. Separated suffixes starting with, or made up by the letter, include: ‑e, ‑eče, and ‑ečegen. Medial and final forms may be distinguished from those of other tooth-shaped letters through: vowel harmony (a) and its effect on the shape of a words consonants (see QA-q/k and GA-γ/g below), or position in syllable sequence (n, ng, d). The final tail extends to the left after bow-shaped consonants (such as b, p, QA-k, and GA-g), and to the right in all other cases. Separated suffixes starting with, or made up by the letter, include: ‑i, ‑iyan/‑iyen, and ‑iyar/‑iyer. Today often absorbed into a preceding syllable when at the end of a word. Written identically to u in native words;:19:9 distinction depending on context. Written identically to o in native words;:19:9 distinction depending on context. Separated suffixes starting with, or made up by the letter, include: ‑u, ‑un, ‑ud, and ‑uruγu. Written identically to ü in native words;:20:9 distinction depending on context. The first medial form is used in the first syllable of native words,:546 and in subsequent medial positions of loanwords. Separated suffixes starting with, or made up by the letter, include: ‑ü, ‑ün, ‑ügei, and ‑üd. Written identically to ö in native words;:20:9 distinction depending on context. Stands in for e in loanwords,:104, 108 as in ᠧᠦ᠋ᠷᠣᠫᠠ ēüropa / европ yevrop. Separated suffixes starting with the letter, include: ‑nar/‑ner, and ‑nuγud/‑nügüd. Distinction from other tooth-shaped letters by position in syllable sequence. Separated suffixes starting with the letter, include: ‑ban/‑ben, and ‑bar/‑ber. For Classical Mongolian, Latin v is used only for transcribing foreign words, so most в (v) in Cyrillic Mongolian correspond to б (b) in Classical Mongolian. Transcribes Chakhar /x/; Khalkha /x/. Separated suffixes starting with the letter, include: ‑ki, and ‑kin. May turn silent between two adjacent vowels, and merge these into a long vowel or diphtong. :36–37:49 Qaγan (ᠬᠠᠭᠠᠨ) 'Khagan' for instance, is read as Qaan unless reading classical literary Mongolian. Some exceptions like tsa-g-aan 'white' exist. Also transliterated scholarly with Latin ɣ.
Transcribes Chakhar /g/; Khalkha /g/. May turn silent between two adjacent vowels, and merge these into a long vowel or diphtong. :36–37:49 Deger for instance, is read as deer. Some exceptions like ügüi 'no' exist. Separated suffixes starting with the letter, include: ‑luγ‑a/‑lüge. Transcribes Chakhar /s/, or /ʃ/ before i;:58 Khalkha /s/, or /ʃ/ before i.
Transcribes Chakhar /ʃ/; Khalkha /ʃ/. Separated suffixes starting with the letter, include: ‑tai/‑tei, ‑taγan/‑tegen, ‑tayiγan/‑teyigen, and ‑tu(r)/‑tü(r). The lamedh glyph may appear with a diagonal oval shape in handwriting, similar in form to galik TA ᢐ,:096 or more angular and closer in shape to galik DA ᢑ in older texts. Separated suffixes starting with the letter, include: ‑daki/‑deki, ‑daγ/‑deg, ‑daγan/‑degen, ‑duγar/‑düger, and ‑du(r)/‑dü(r). Transcribes Chakhar /t͡ʃ/; Khalkha /t͡ʃʰ/, or /t͡sʰ/ (corresponds to Cyrillic ц). :§ 1.2:2 Distinction between /t͡ʃʰ/ and /t͡sʰ/ in Khalkha Mongolian. Transcribes Chakhar /d͡ʒ/; Khalkha /d͡ʒ/, or d͡z (corresponds to Cyrillic з). :§ 1.2:2 Distinction by context between /d͡ʒ/ and /d͡z/ in Khalkha Mongolian. Also transliterated scholarly with Latin j. Separated suffixes starting with the letter, include: ‑yi, ‑yin, and ‑yuγan/‑yügen. Not occurring word-initially except in loanwords. :14 Transcribed foreign words usually get a vowel prepended; transcribing Русь (Russia) results in ᠣᠷᠤᠰ Oros. Also transliterated scholarly with latin v.
Derived from Old Uyghur bet,:539–540, 545–546:111, 113:97 and "waw" (before a separated vowel). Used to transcribe foreign words. Also transliterated scholarly with latin k.
Also transliterated scholarly with latin kh. Transcribes Chinese r /ɻ/ ([ɻ ~ ʐ];[f] as in 日 Ri), and used in Inner Mongolia. Always followed by an i.
Transcribes Tibetan lh (as in ᡀᠠᠰᠠ Lhasa). Transliteration: Wikipēdiya čilügetü nebterkei toli bičig bolai. Cyrillic: Википедиа чөлөөт нэвтэрхий толь бичиг болой. Transcription: Vikipedia chölööt nevterkhii toli bichig boloi. Gloss: Wikipedia free omni-profound mirror scripture is. Translation: Wikipedia is the free encyclopedia. Mongolian Wikipedia preview. A representation of what mn.wiki would look like if Mongolian script support was properly implemented. Mn.wiki already exists, but support has not been implemented. Not all text is "real Mongolian" — only the text and name of the article are, the rest of the text being English written in Mongolian script. Title of The Secret History of the Mongols in a style with vertical tails. The Mongol script has been the basis of alphabets for several languages. First, after overcoming the Uyghur script ductus, it was used for Mongolian itself. In 1648, the Oirat Buddhist monk Zaya-pandita Namkhaijamco created this variation with the goals of bringing the written language closer to the actual pronunciation of Oirat and making it easier to transcribe Tibetan and Sanskrit. The script was used by the Kalmyks of Russia until 1924, when it was replaced by the Cyrillic alphabet. In Xinjiang, China, the Oirat people still use it. 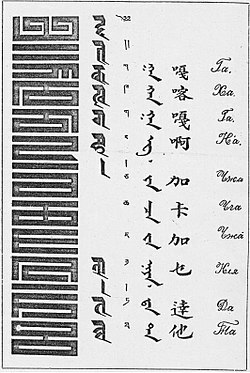 The Manchu alphabet was developed from the Mongolian script in the early 17th century to write the Manchu language. A variant is still used to write Xibe. It is also used for Daur. Its folded variant may for example be found on Chinese Qing seals. Another alphabet, sometimes called Vagindra or Vaghintara, was created in 1905 by the Buryat monk Agvan Dorjiev (1854–1938). It was also meant to reduce ambiguity, and to support the Russian language in addition to Mongolian. The most significant change, however, was the elimination of the positional shape variations. All letters were based on the medial variant of the original Mongol alphabet. Fewer than a dozen books were printed using it. The Qing dynasty Qianlong Emperor erroneously identified the Khitan people and their language with the Solons, leading him to use the Solon language (Evenki) to "correct" Chinese character transcriptions of Khitan names in the History of Liao in his "Imperial Liao Jin Yuan Three Histories National Language Explanation" (欽定遼金元三史國語解/钦定辽金元三史国语解 Qīndìng Liáo Jīn Yuán Sānshǐ Guóyǔjiě) project. The Evenki words were written in the Manchu script in this work. In the 1980s, an experimental alphabet for Evenki was created. In 1587, the translator and scholar Ayuush Güüsh (Аюуш гүүш) created the Galik alphabet (Али-гали), inspired by the third Dalai Lama, Sonam Gyatso. It primarily added extra characters for transcribing Tibetan and Sanskrit terms when translating religious texts, and later also from Chinese. Some of those characters are still in use today for writing foreign names (compare table above). Mongolian script was added to the Unicode Standard in September 1999 with the release of version 3.0. The Unicode block for Mongolian is U+1800–U+18AF. It includes letters, digits and various punctuation marks for Hudum Mongolian, Todo Mongolian, Xibe (Manchu), Manchu proper, and Ali Gali, as well as extensions for transcribing Sanskrit and Tibetan. Although the Mongolian script has been defined in Unicode since 1999, there was no native support for Unicode Mongolian from the major vendors until the release of the Windows Vista operating system in 2007 and fonts need to be installed in Windows XP and Windows 2000 to show properly, and so Unicode Mongolian is not yet widely used. In China, legacy encodings such as the Private Use Areas (PUA) Unicode mappings and GB18030 mappings of the Menksoft IMEs (espc. Menksoft Mongolian IME) are more commonly used than Unicode for writing web pages and electronic documents in Mongolian. The inclusion of a Unicode Mongolian font and keyboard layout in Windows Vista has meant that Unicode Mongolian is now gradually becoming more popular, but the complexity of the Unicode Mongolian encoding model and the lack of a clear definition for the use variation selectors are still barriers to its widespread adoption, as is the lack of support for inline vertical display. As of 2015 there are no fonts that successfully display all of Mongolian correctly when written in Unicode. A report published in 2011 revealed many shortcomings with automatic rendering in all three Unicode Mongolian fonts the authors surveyed, including Microsoft's Mongolian Baiti. Furthermore, Mongolian language support has suffered from buggy implementations: the initial version of Microsoft's Mongolian Baiti font (version 5.00) was, in the supplier's own words, "almost unusable", and as of 2011 there remain some minor bugs with the rendering of suffixes in Firefox. Other fonts, such as Monotype's Mongol Usug and Myatav Erdenechimeg's MongolianScript, suffer even more serious bugs. In January 2013, Menksoft released several OpenType Mongolian fonts, delivered with its Menksoft Mongolian IME 2012. These fonts strictly follow Unicode standard, i.e. bichig is no longer realized as "B+I+CH+I+G+FVS2" (incorrect) but "B+I+CH+I+G" (correct), which is not done by Microsoft and Founder's Mongolian Baiti, Monotype's Mongol Usug, or Myatav Erdenechimeg's MongolianScript. However, due to the impact of Mongolian Baiti, many still use the Microsoft defined incorrect realization "B+I+CH+I+G+FVS2", which results in an incorrect rendering in correctly-designed fonts like Menk Qagan Tig. Mongolian script can be represented in LaTeX with the MonTeX package. In text sample below, the appearance of the scripts should match. The more specific shapes include the final shapes on lines 1 (yin suffix), 3 (separated a), and 4/6 (vowel harmony dependent g) in the middle column, and the interrogative particle uu/üü in the rightmost column. Note that in some browsers, letters are rotated 90° counterclockwise. If the isolate letter a (ᠠ) resembles a 'W' and not a 'Σ', rotate the letters 90° clockwise. ^ Lee & Zee (2003) and Lin (2007) transcribe these as approximants, while Duanmu (2007) transcribes these as voiced fricatives. The actual pronunciation has been acoustically measured to be more approximant-like. ^ Campbell, George L. (1997). Handbook of Scripts and Alphabets. Psychology Press. ISBN 978-0-415-18344-4. ^ a b c d e f g h i j k l m n o p q r s t u v w x y z aa ab ac ad ae af ag ah ai aj Daniels, Peter T. (1996). The World's Writing Systems. Oxford University Press. ISBN 978-0-19-507993-7. ^ a b c d e f g h i j k l m n o p q r s t u v w x y z aa ab ac ad ae af ag ah ai aj ak al am an ao ap aq ar as at au av aw ax ay az ba bb bc bd be Poppe, Nicholas (1974). Grammar of Written Mongolian. Otto Harrassowitz Verlag. ISBN 978-3-447-00684-2. ^ a b György Kara, "Aramaic Scripts for Altaic Languages", in Daniels & Bright The World's Writing Systems, 1994. ^ Shepherd, Margaret (2013-07-03). Learn World Calligraphy: Discover African, Arabic, Chinese, Ethiopic, Greek, Hebrew, Indian, Japanese, Korean, Mongolian, Russian, Thai, Tibetan Calligraphy, and Beyond. Potter/Ten Speed/Harmony/Rodale. ISBN 978-0-8230-8230-8. ^ Chinggeltei. (1963) A Grammar of the Mongol Language. New York, Frederick Ungar Publishing Co. p. 15. ^ a b Скородумова, Лидия Григорьевна (2000). Введение в старописьменный монгольский язык: учебное пособие (PDF) (in Russian). Изд-во Дом "Муравей-Гайд". ISBN 9785846300156. ^ a b Shagdarsürüng, Tseveliin (2001). ""Study of Mongolian Scripts (Graphic Study or Grammatology). Enl."". Bibliotheca Mongolica: Monograph 1. ^ a b c d e f g h i j k l m n o p q r s t u v w x y z aa ab ac ad ae af ag ah ai aj ak al am an ao ap aq ar as at au av aw ax ay az ba bb bc bd be bf bg Janhunen, Juha (2006-01-27). The Mongolic Languages. Routledge. ISBN 978-1-135-79689-1. ^ Mongol Times (2012). "Monggul bichig un job bichihu jui-yin toli". ^ a b c d e f "The Unicode® Standard Version 10.0 – Core Specification: South and Central Asia-II" (PDF). Unicode.org. Retrieved 3 December 2017. ^ a b Bat-Ireedui, Jantsangiyn; Sanders, Alan J. K. (2015-08-14). Colloquial Mongolian: The Complete Course for Beginners. Routledge. ISBN 978-1-317-30598-9. ^ Gehrke, Munkho. "Монгол бичгийн зурлага :|: Монгол бичиг". mongol-bichig.dusal.net (in Mongolian). Retrieved 2019-04-18. ^ "ᠵᠢᠷᠤᠯᠭ᠎ᠠ ᠪᠠ ᠲᠡᠭᠦᠨ ᠦ ᠨᠡᠷᠡᠢᠳᠦᠯ - ᠮᠤᠩᠭᠤᠯ ᠪᠢᠴᠢᠭ". www.mongolfont.com. Retrieved 2019-04-18. ^ a b c d e f g "Mongolian State Dictionary". mongoltoli.mn. Retrieved 2017-12-14. ^ a b "Unicode Technical Report #2". ftp.tc.edu.tw. Retrieved 2017-12-13. ^ a b c d e f g h i j k l m n o p q r s t u v w x y z aa ab ac ad ae af ag ah ai aj ak al am an ao ap aq ar as at au av aw ax "Mongolian Traditional Script". cjvlang.com. Retrieved 2017-12-07. ^ a b in Inner Mongolia. ^ a b c d e f g h i j k l m n o p q r s t u v w x y z aa ab ac ad ae af ag ah ai Grønbech, Kaare; Krueger, John Richard (1993). An Introduction to Classical (literary) Mongolian: Introduction, Grammar, Reader, Glossary. Otto Harrassowitz Verlag. ISBN 978-3-447-03298-8. ^ a b c d e f g h i j k l "A Study of Traditional Mongolian Script Encodings and Rendering: Use of Unicode in OpenType fonts" (PDF). w.colips.org. Retrieved 9 November 2017. ^ a b c d e f g h i j k l m n o p q r s t Svantesson, Jan-Olof (2005). The Phonology of Mongolian. https://media.turuz.com/Language/2012/0122-(5)moghol_(monqol)_dilinin_ses_bilimi-fonoloji(18.163KB).pdf#page=61: Oxford University Press. pp. 40–42. ISBN 0-19-926017-6. ^ a b c d e f "Mongolian / ᠮᠣᠩᠭᠣᠯ Moŋġol" (PDF). www.eki.ee. Retrieved 2017-11-18. ^ a b c d http://andreasviklund.com/, Original design: Andreas Viklund -. "Lingua Mongolia – Mongolian Grammar". www.linguamongolia.com. Retrieved 2017-12-13. ^ a b c d e f g h i j k l m "PROPOSAL Encode Mongolian Suffix Connector (U+180F) To Replace Narrow Non-Breaking Space (U+202F)" (PDF). Unicode.org. Retrieved 23 August 2017. ^ "The Mongolian Script" (PDF). Lingua Mongolia. ^ a b c d Janhunen, Juha A. (2012). Mongolian. John Benjamins Publishing. ISBN 9027238200. ^ a b c d e f g h i "Mongolian transliterations" (PDF). Institute of the Estonian Language. ^ a b c d e f g h i j k l m n o p q r s t u v w x y z aa ab ac ad ae af ag ah ai "Writing | Study Mongolian". www.studymongolian.net. Retrieved 2017-12-14. ^ a b c d e f g h i j k l m n o p q r s t u v w x y z aa ab ac Clauson, Gerard (2005-11-04). Studies in Turkic and Mongolic Linguistics. Routledge. ISBN 978-1-134-43012-3. ^ "Retrieval in Texts with Traditional Mongolian Script Realizing Unicoded Traditional Mongolian Digital Library (PDF Download Available)". ResearchGate. Retrieved 2017-12-01. ^ Baumann, Brian Gregory (2008). Divine Knowledge: Buddhist Mathematics According to the Anonymous Manual of Mongolian Astrology and Divination. BRILL. ISBN 9004155759. ^ a b c d e f g h i j k "BabelStone : Mongolian and Manchu Resources". babelstone.co.uk. Retrieved 2017-08-17. ^ a b c d e f "Digitales Turfanarchiv". turfan.bbaw.de. Retrieved 2017-12-18. ^ a b Letter from Arghun, Khan of the Mongol Ilkhanate, to Pope Nicholas IV, 1290. ^ Letter from Oljeitu to Philippe le Bel, 1305. ^ "ᠮᠣᠩᠭᠣᠯ ᠪᠢᠴᠢᠭ᠌ ᠦᠨ ᠣᠷᠤᠭᠤᠯᠬᠤ ᠠᠷᠭ᠎ᠠ - ᠮᠤᠩᠭ᠋ᠤᠯ ᠪᠢᠴᠢᠭ᠌". www.mongolfont.com. Retrieved 2017-12-15. ^ Otgonbayar Chuluunbaatar (2008). Einführung in die Mongolischen Schriften (in German). Buske. ISBN 978-3-87548-500-4. ^ a b Biligsaikhan Batjargal; et al. (2011). "A Study of Traditional Mongolian Script Encodings and Rendering: Use of Unicode in OpenType fonts" (PDF). International Journal of Asian Language Processing. 21 (1): 23–43. Retrieved 2011-09-10. ^ Menk Qagan Tig, Menk Hawang Tig, Menk Garqag Tig, Menk Har_a Tig, and Menk Scnin Tig. ^ "CTAN: Package montex". ctan.org. Retrieved 2018-01-21. 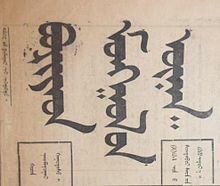 Wikimedia Commons has media related to Mongolian script.